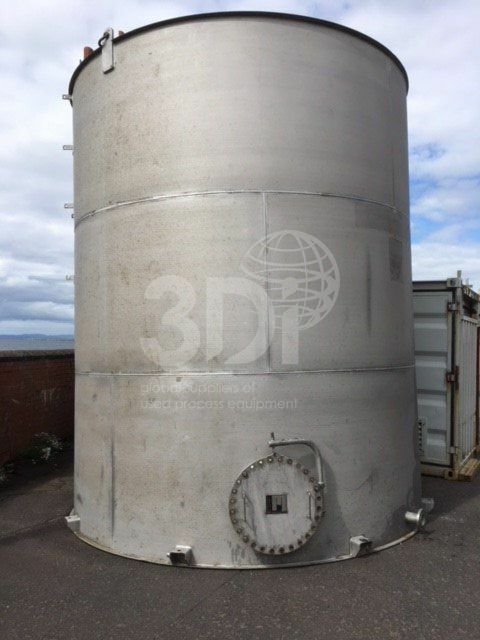 Used 50,000 Litre Stainless Steel Storage Vessel, manufactured by Robert Sanderson & Sons Ltd, 2003. Material of construction: 304 stainless steel. Orientation: vertical, cylindrical, flat bottom, tented top. Dimensions: 4000mm diameter, 4500mm on the straight, 5000mm overall height. Connections: (1) side bottom man way, (2) 76mm outlet, (3) 76mm inlet, (2) 50mm inlet. Design code: Sound Engineering. Design temp 100degC. Design pressure atmospheric. Empty weight 3500kgs. Previously used on chemicals.